Plants grow in soil, so why bother keeping it off their leaves? As anyone who has gone away for 2 weeks knows, it doesn’t take long for dust to accumulate. A layer of dust on the leaves of houseplants will block sunlight and reduce the plant’s ability to photosynthesize. Photosynthesis is how the plant feeds itself. A clean plant that’s photosynthesizing at optimal levels will be a healthier plant and healthy plants don’t get diseases and pest infestations. So periodically cleaning the leaves of your houseplants actually, makes less work for you in the long run. And it will make your home look better. That really depends on how much dust is in your air. Folks with dirt roads, construction and a lot of wind will need to clean their houseplants more often. The best way to tell if a plant needs cleaning is to rub your fingers on the leaves. If you can feel or see dust more dust than you can blow off the leaves, it’s time to clean. Spray the whole plant: The easiest method for cleaning houseplants is to move them to the kitchen sink or shower and hose them off. Test the water before spraying, to make sure it is lukewarm. Both hot and cold water can injure the plant’s leaves. If your plants are really grimy, you can spray them with a dilute soapy water mixture and then hose them off. Use about 1/4 tbsp. dish soap per 1 qt. of water. Small plants that can’t handle the force of a spray can be cleaned by holding the base of the plant at soil level, inverting it into a bucket of water and swishing the leaves about. Watering the soil beforehand will help prevent the soil from falling out when the pot is inverted. You could also wrap plastic wrap around the base of the plant, to contain the soil while cleaning. Again, be sure to use lukewarm water. Let the plants drip dry before moving them back. Wipe individual leaves: For plants that are too large to move, you can simply wipe the leaves off with a damp cloth. After the initial cleaning, you can help keep dust from building up on the leaves by using a soft duster on them whenever you dust your house. Brush off the dust: Some plants have sticky or fuzzy leaves that just don’t lend themselves to easy cleaning. And in the case of plants like African Violets, that don’t like getting their leaves wet, neither spraying or wiping is the answer. For fuzzy leaved plants, use a soft brush, like a mushroom brush, to very gently coax the dust from the leaves. Trim and clean-up leaves: While washing plants, it's easy to further tidy them up by getting rid of their dead, brown or yellowing leaves. If the leaf falls loose easily, remove it by hand. Otherwise, use scissors. Never pull resistant leaves of a plant, and only prune away just the browned leaf tips from plants that were left too dry. The plant will look more natural if you follow the natural contour of the leaves when cutting. Clean the plant’s pot: After putting in all this effort for cleaning your plants, why not ensure that the pots are in shape too? If salt or minerals have formed a white layer on the outside or rim of your flower pot, remove the plant, and thoroughly clean the pot. Wash the pot with a dilute bleach solution of 1 part bleach to 10 parts water. Scrub all the salt residue with a stiff brush, and rinse the pot well before re-potting your plant. Prevent future build-up on pots by periodically flushing the soil in the pots. 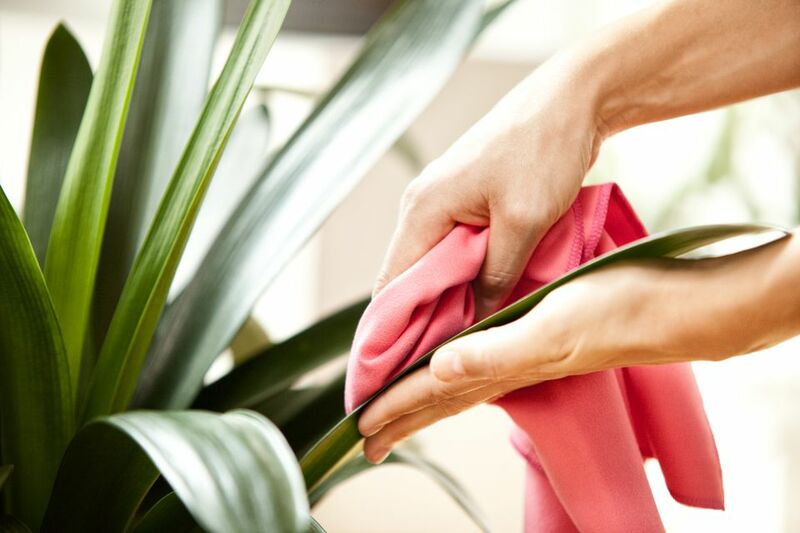 Initially, it might sound like a lot of work to keep houseplants clean, but an occasional cleaning is not really that much effort, and it will keep your houseplants looking and growing better.